"Schiller" redirects here. For other uses, see Schiller (disambiguation). Johann Christoph Friedrich von Schiller (German: [ˈjoːhan ˈkʁɪstɔf ˈfʁiːdʁɪç fɔn ˈʃɪlɐ]; 10 November 1759 – 9 May 1805) was a German poet, philosopher, physician, historian, and playwright. During the last seventeen years of his life (1788–1805), Schiller struck up a productive, if complicated, friendship with the already famous and influential Johann Wolfgang von Goethe. They frequently discussed issues concerning aesthetics, and Schiller encouraged Goethe to finish works he left as sketches. This relationship and these discussions led to a period now referred to as Weimar Classicism. They also worked together on Xenien, a collection of short satirical poems in which both Schiller and Goethe challenge opponents of their philosophical vision. 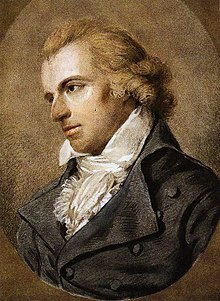 Friedrich Schiller was born on 10 November 1759, in Marbach, Württemberg, as the only son of military doctor Johann Kaspar Schiller [de] (1733–1796) and Elisabeth Dorothea Kodweiß [de] (1732–1802). They also had five daughters, including Christophine, the eldest. Schiller grew up in a very religious family and spent much of his youth studying the Bible, which would later influence his writing for the theatre. His father was away in the Seven Years' War when Friedrich was born. He was named after king Frederick the Great, but he was called Fritz by nearly everyone. Kaspar Schiller was rarely home during the war, but he did manage to visit the family once in a while. His wife and children also visited him occasionally wherever he happened to be stationed. When the war ended in 1763, Schiller's father became a recruiting officer and was stationed in Schwäbisch Gmünd. The family moved with him. Due to the high cost of living—especially the rent—the family moved to the nearby town of Lorch. Although the family was happy in Lorch, Schiller's father found his work unsatisfying. He sometimes took his son with him. In Lorch, Schiller received his primary education. The quality of the lessons was fairly bad, and Friedrich regularly cut class with his older sister. Because his parents wanted Schiller to become a priest, they had the priest of the village instruct the boy in Latin and Greek. Father Moser was a good teacher, and later Schiller named the cleric in his first play Die Räuber (The Robbers) after him. As a boy, Schiller was excited by the idea of becoming a cleric and often put on black robes and pretended to preach. In 1766, the family left Lorch for the Duke of Württemberg's principal residence, Ludwigsburg. Schiller's father had not been paid for three years, and the family had been living on their savings but could no longer afford to do so. So Kaspar Schiller took an assignment to the garrison in Ludwigsburg. There the boy Schiller came to the attention of Karl Eugen, Duke of Württemberg. He entered the Karlsschule Stuttgart (an elite military academy founded by the Duke), in 1773, where he eventually studied medicine. During most of his short life, he suffered from illnesses that he tried to cure himself. While at the Karlsschule, Schiller read Rousseau and Goethe and discussed Classical ideals with his classmates. At school, he wrote his first play, The Robbers, which dramatizes the conflict between two aristocratic brothers: the elder, Karl Moor, leads a group of rebellious students into the Bohemian forest where they become Robin Hood-like bandits, while Franz Moor, the younger brother, schemes to inherit his father's considerable estate. The play's critique of social corruption and its affirmation of proto-revolutionary republican ideals astounded its original audience. Schiller became an overnight sensation. Later, Schiller would be made an honorary member of the French Republic because of this play. The play was inspired by Leisewitz' earlier play Julius of Tarent, a favourite of the young Schiller. In 1780, he obtained a post as regimental doctor in Stuttgart, a job he disliked. In order to attend the first performance of The Robbers in Mannheim, Schiller left his regiment without permission. As a result, he was arrested, sentenced to 14 days of imprisonment, and forbidden by Karl Eugen from publishing any further works. He fled Stuttgart in 1782, going via Frankfurt, Mannheim, Leipzig, and Dresden to Weimar. Along this journey he had an affair with an army officer's wife Charlotte von Kalb. She was at the centre of an intellectual circle, and she was known for her cleverness and instability. Schiller needed help from his family and friends to extricate himself from his financial situation and attachment to a married woman. Schiller settled in Weimar in 1787. In 1789, he was appointed professor of History and Philosophy in Jena, where he wrote only historical works. He was ennobled in 1802, thereby adding the honorific von to his name. On 22 February 1790, Schiller married Charlotte von Lengefeld (1766–1826). Two sons (Karl Friedrich Ludwig and Ernst Friedrich Wilhelm) and two daughters (Karoline Luise Henriette and Luise Henriette Emilie) were born between 1793 and 1804. The last living descendant of Schiller was a grandchild of Emilie, Baron Alexander von Gleichen-Rußwurm, who died at Baden-Baden, Germany, in 1947. 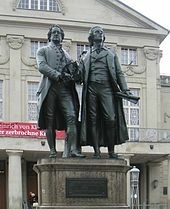 Schiller returned with his family to Weimar from Jena in 1799. Goethe convinced him to return to playwriting. He and Goethe founded the Weimar Theater, which became the leading theater in Germany. Their collaboration helped lead to a renaissance of drama in Germany. For his achievements, Schiller was ennobled in 1802 by the Duke of Saxe-Weimar, adding the nobiliary particle "von" to his name. He remained in Weimar, Saxe-Weimar until his death at 45 from tuberculosis in 1805. The first authoritative biography of Schiller was by his sister-in-law Caroline von Wolzogen in 1830, Schillers Leben (Schiller's Life). The coffin containing what was purportedly Schiller's skeleton was brought in 1827 into the Weimarer Fürstengruft (Weimar's Ducal Vault), the burial place of the house of Saxe-Weimar-Eisenach in the Historical Cemetery of Weimar and later also Goethe's resting place. On 3 May 2008, scientists announced that DNA tests have shown that the skull of this skeleton is not Schiller's, and his tomb is now vacant. The physical resemblance between this skull and the extant death mask as well as to portraits of Schiller, had led many experts to believe that the skull was Schiller's. The city of Stuttgart erected in 1839 a statue in his memory on a square renamed Schillerplatz. A Schiller monument was unveiled on Berlin's Gendarmenmarkt in 1871. There is a Friedrich Schiller statue on Belle Isle in Detroit Michigan. This statue of the German playwright was commissioned by Detroit's German-American community in 1908 at a cost of $12,000; the designer was Herman Matzen. His image appeared on the German Democratic Republic 10 Mark banknotes of the 1964 emission. In September 2008, Schiller was voted by the audience of the TV channel Arte as the second most important playwright in Europe after William Shakespeare. Some Freemasons speculate that Schiller was a Freemason, but this has not been proven. In a letter from 1829, two Freemasons from Rudolstadt complain about the dissolving of their Lodge Günther zum stehenden Löwen that was honoured by the initiation of Schiller. According to Schiller's great-grandson Alexander von Gleichen-Rußwurm, Schiller was brought to the Lodge by Wilhelm Heinrich Karl von Gleichen-Rußwurm. No membership document has been found. Schiller wrote many philosophical papers on ethics and aesthetics. He synthesized the thought of Immanuel Kant with the thought of the German Idealist philosopher, Karl Leonhard Reinhold. He elaborated Christoph Martin Wieland's concept of die schöne Seele (the beautiful soul), a human being whose emotions have been educated by reason, so that Pflicht und Neigung (duty and inclination) are no longer in conflict with one another; thus beauty, for Schiller, is not merely an aesthetic experience, but a moral one as well: the Good is the Beautiful. The link between morality and aesthetics also occurs in Schiller's controversial poem, "Die Götter Griechenlandes (The Gods of Greece)." The "gods" in Schiller's poem are thought by modern scholars to represent moral and aesthetic values, which Schiller tied to Paganism and an idea of enchanted nature. In this respect, Schiller's aesthetic doctrine shows the influence of Christian Theosophy. There is general consensus among scholars that it makes sense to think of Schiller as a liberal, and he is frequently cited as a cosmopolitan thinker. Schiller's philosophical work was particularly concerned with the question of human freedom, a preoccupation which also guided his historical researches, such as the Thirty Years' War and the Dutch Revolt, and then found its way as well into his dramas (the Wallenstein trilogy concerns the Thirty Years' War, while Don Carlos addresses the revolt of the Netherlands against Spain.) Schiller wrote two important essays on the question of the sublime (das Erhabene), entitled "Vom Erhabenen" and "Über das Erhabene"; these essays address one aspect of human freedom—the ability to defy one's animal instincts, such as the drive for self-preservation, when, for example, someone willingly sacrifices themselves for conceptual ideals. Schiller is considered by most Germans to be Germany's most important classical playwright. Critics like F.J. Lamport and Eric Auerbach have noted his innovative use of dramatic structure and his creation of new forms, such as the melodrama and the bourgeois tragedy. What follows is a brief, chronological description of the plays. The Robbers (Die Räuber): The language of The Robbers is highly emotional, and the depiction of physical violence in the play marks it as a quintessential work of Germany's Romantic Sturm und Drang movement. The Robbers is considered by critics like Peter Brooks to be the first European melodrama. The play pits two brothers against each other in alternating scenes, as one quests for money and power, while the other attempts to create revolutionary anarchy in the Bohemian Forest. The play strongly criticises the hypocrisies of class and religion, and the economic inequities of German society; it also conducts a complicated inquiry into the nature of evil. Schiller was inspired by the play Julius of Tarent by Johann Anton Leisewitz. Intrigue and Love (Kabale und Liebe): The aristocratic Ferdinand von Walter wishes to marry Luise Miller, the bourgeois daughter of the city's music instructor. Court politics involving the duke's beautiful but conniving mistress Lady Milford and Ferdinand's ruthless father create a disastrous situation reminiscent of Shakespeare's Romeo and Juliet. Schiller develops his criticisms of absolutism and bourgeois hypocrisy in this bourgeois tragedy. Act 2, scene 2 is an anti-British parody that depicts a firing-squad massacre. Young Germans who refused to join the Hessians and British to quash the American Revolutionary War are fired upon. Don Carlos: This play marks Schiller's entrée into historical drama. Very loosely based on the events surrounding the real Don Carlos of Spain, Schiller's Don Carlos is another republican figure—he attempts to free Flanders from the despotic grip of his father, King Phillip. The Marquis Posa's famous speech to the king proclaims Schiller's belief in personal freedom and democracy. The Wallenstein trilogy: Consisting of Wallenstein's Camp, The Piccolomini, and Wallenstein's Death, these plays follow the fortunes of the treacherous commander Albrecht von Wallenstein during the Thirty Years' War. Mary Stuart (Maria Stuart): This history of the Scottish queen, who was Elizabeth I's rival, portrays Mary Stuart as a tragic heroine, misunderstood and used by ruthless politicians, including and especially, Elizabeth. A pivotal work by Schiller was On the Aesthetic Education of Man in a Series of Letters (Über die ästhetische Erziehung des Menschen in einer Reihe von Briefen), first published 1794, which was inspired by the great disenchantment Schiller felt about the French Revolution, its degeneration into violence and the failure of successive governments to put its ideals into practice. Schiller wrote that "a great moment has found a little people"; he wrote the Letters as a philosophical inquiry into what had gone wrong, and how to prevent such tragedies in the future. In the Letters he asserts that it is possible to elevate the moral character of a people, by first touching their souls with beauty, an idea that is also found in his poem Die Künstler (The Artists): "Only through Beauty's morning-gate, dost thou penetrate the land of knowledge." On the philosophical side, Letters put forth the notion of der sinnliche Trieb / Sinnestrieb ("the sensuous drive") and Formtrieb ("the formal drive"). In a comment to Immanuel Kant's philosophy, Schiller transcends the dualism between Formtrieb and Sinnestrieb with the notion of Spieltrieb ("the play drive"), derived from, as are a number of other terms, Kant's Critique of the Faculty of Judgment. The conflict between man's material, sensuous nature and his capacity for reason (Formtrieb being the drive to impose conceptual and moral order on the world), Schiller resolves with the happy union of Formtrieb and Sinnestrieb, the "play drive," which for him is synonymous with artistic beauty, or "living form." On the basis of Spieltrieb, Schiller sketches in Letters a future ideal state (a eutopia), where everyone will be content, and everything will be beautiful, thanks to the free play of Spieltrieb. Schiller's focus on the dialectical interplay between Formtrieb and Sinnestrieb has inspired a wide range of succeeding aesthetic philosophical theory, including notably Jacques Rancière's conception of the "aesthetic regime of art," as well as social philosophy in Herbert Marcuse. In the second part of his important work Eros and Civilization, Marcuse finds Schiller's notion of Spieltrieb useful in thinking a social situation without the condition of modern social alienation. He writes, "Schiller's Letters ... aim at remaking of civilization by virtue of the liberating force of the aesthetic function: it is envisaged as containing the possibility of a new reality principle." Ludwig van Beethoven said that a great poem is more difficult to set to music than a merely good one because the composer must rise higher than the poet – "who can do that in the case of Schiller? In this respect Goethe is much easier," wrote Beethoven. There are relatively few famous musical settings of Schiller's poems. Notable exceptions are Beethoven's setting of "An die Freude" (Ode to Joy) in the final movement of his Ninth Symphony, Johannes Brahms' choral setting of "Nänie" and "Des Mädchens Klage" by Franz Schubert, who set 44 of Schiller's poems as Lieder, mostly for voice and piano, also including "Die Bürgschaft". In 2005 Graham Waterhouse set Der Handschuh (The Glove) for cello and speaking voice. The Italian composer Giuseppe Verdi admired Schiller greatly and adapted several of his stage plays for his operas: I masnadieri is based on The Robbers; Giovanna d'Arco on The Maid of Orleans; Luisa Miller on Intrigue and Love; La forza del destino is based partly on Wallenstein; and Don Carlos on the play of the same title. Donizetti's Maria Stuarda is based on Mary Stuart, and Rossini's Guillaume Tell is an adaptation of William Tell. Nicola Vaccai's Giovanna d'Arco (1827) is based on The Maid of Orleans and his La sposa di Messina (1839) on The Bride of Messina. Tchaikovsky's 1881 opera The Maid of Orleans is partly based on Schiller's work. The 20th-century composer Giselher Klebe adapted The Robbers for his first opera of the same name, which premiered in 1957. And rain at any moment threaten to put out. As if a crime were swiftly carried to the grave! Followed this coffin. 'Twas the Spirit of Mankind. ^ Simons, John D (1990). "Frederich Schiller". Dictionary of Literary Biography, Volume 94: German Writers in the Age of Goethe: Sturm und Drang to Classicism. ISBN 9780810345744. ^ Lahnstein 1984, p. 18. ^ Lahnstein 1984, p. 20. ^ Lahnstein 1984, pp. 20–21. ^ Lahnstein 1984, p. 23. ^ Lahnstein 1984, p. 24. ^ Lahnstein 1984, p. 25. ^ Lahnstein 1984, p. 27. ^ "Friedrich Schiller biography". Studiocleo.com. Retrieved 6 November 2013. ^ Sharpe, Lesley (April 1999). "Female Illness and Male Heroism: The Works of Caroline von Wolzogen". German Life and Letters. 52 (2): 184–196. doi:10.1111/1468-0483.00129. ^ "Schädel in Schillers Sarg wurde ausgetauscht" (Skull in Schiller's coffin has been exchanged), Der Spiegel, 3 May 2008. "Schädel in Weimar gehört nicht Schiller" (Skull in Weimar does not belong to Schiller), Die Welt, 3 May 2008. ^ "Death Mask". Sammlungen.hu-berlin.de. Retrieved 6 November 2013. ^ "Friedrich Von Schiller". Freemasonry.bcy.ca. Retrieved 6 November 2013. ^ Josephson-Storm, Jason (2017). The Myth of Disenchantment: Magic, Modernity, and the Birth of the Human Sciences. Chicago: University of Chicago Press. p. 82-3. ISBN 0-226-40336-X. ^ Martin, Nicholas (2006). Schiller: A Birmingham Symposium. Rodopi. p. 257. ^ Gray, John (1995). Liberalism. U of Minnesota Press. p. 33. ^ Sharpe, Lesley (1991). Friedrich Schiller: Drama, Thought and Politics. Cambridge University Press. p. 2. ^ Bell, Duncan (2010). Ethics and World Politics. Oxford University Press. p. 147. ^ Sanahuja, Lorena Cebolla; Ghia, Francesco (2015). Cosmopolitanism: Between Ideals and Reality. Cambridge Scholars Publishing. p. 43-44. ^ Cavallar, Georg (2011). Imperfect Cosmopolis: Studies in the history of international legal theory and cosmopolitan ideas. University of Wales Press. p. 41. ^ Sharpe, Lesley (1995). Schiller's Aesthetic Essays: Two Centuries of Criticism. Camden House. p. 58. ^ "Beethoven: the man and the artist, as revealed by his own words, Project Gutenberg". Retrieved 20 November 2011. ^ Munsterberg, Margarete (1916). A Harvest of German Verse. New York and London: D. Appleton and Company. p. 242. ^ Mike Poulton translated this play in 2004. ^ Wallenstein was translated from a manuscript copy into English as The Piccolomini and Death of Wallenstein by Coleridge in 1800. Lahnstein, Peter (January 1984) . Schillers Leben. Frankfurt am Main: Fischer. ISBN 3-596-25621-6. Wikimedia Commons has media related to Friedrich Schiller.